During the aggression on Republic of B&H, all the mosques in the Visegrad Municipality were systematically destroyed by the Bosnian Serb Army(Vojska Republike Srpske). Image: The Gazanfer-begova/Gazander Bey’s Mosque also known as Atik dzamija/Old Mosque before the war. Image: The site where the Gazanfer Bey’s mosque in the center of the town. Destroyed in 1992, today it is a park. Image: The Bikavac or Careva/Emperor’s mosque in Visegrad. Burn ablaze and bulldozed by Bosnian Serb Army in 1992. Image: The Careva dzamija/Emperor’s Mosque also known as the Bikavac mosque, was originally built in the sixteenth century and was renovated in 1910 and 1947. Image: The Emperor’s Mosque set ablaze by Bosnian Serb Army in Visegrad, June 1992. Image: The site where the Emperor’s mosque stood. Picture taken a few years after the war’s end. Image: The Careva mosque in the center of Visegrad. Destroyed in 1992 by the Bosnian Serb Army. Reconstructed by the Islamic Community of Bosnia and Herzegovina with funding by Visegrad’s Bosniak diaspora. Image: Mosque in Drinsko, Visegrad. Built in 1885, burnt down in 1941 by Yugoslav Serb Royalists popularly known as “Chetniks” led by Draza Mihailovic. After 26 years the Communist regime finally gave permission to restore and reopen the mosque (1967). The mosque was destroyed by Bosnian Serb Army in 1992, rebuilt and reopened a few years ago. Image: The Drinsko Mosque in 2002. Image: Mosque in Drinsko. Destroyed in 1992 by Bosnian Serb Army.Reconstructed by the Islamic Community of Bosnia and Herzegovina with funding by Visegrad’s Bosniak diaspora. Image: An Islamic school(mekteb) in Barimo. Destroyed by the Bosnian Serb Army in 1992. Image: An Islamic school(mekteb) in Holijaci. Destroyed by the Bosnian Serb Army in 1992. Image: Mosque in Orahovci. Destroyed by the Bosnian Serb Army in 1992. Image: A mosque in Zlijeb. Destroyed by the Bosnian Serb Army in 1992.See more on Žlijeb mosque here. Image: An Imam‘s house in Zlijeb. Destroyed by the Bosnian Serb Army in 1992. 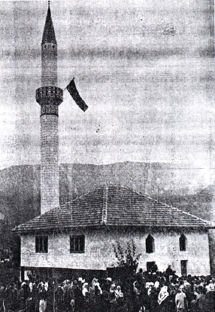 Image: The Dobrun Mosque, totally destroyed in 1992 by the Bosnian Serb Army. Rebuilt and opened in 2006 by funds from Visegrad’s Bosniak diaspora. All these buildings were destroyed in a systematic way, by Visegrad Serbs, most of whom were neighbors to their Bosniak victims. All of them, whether they were armed civilians,members of “para-military” units, or members of the Visegrad Brigade, were members of the Republika Srpska Army or it’s Police force. This was organized and planned by the Visegrad Municipality, i.e. by the Serb Democratic Party Crisis Committee. No one has answered for the destruction of mosques in Visegrad. Note: Pictures were taken from MIZ Visegrad. Natasa Kandic, the director of “Fond for Humanitarian Law” in Belgrade gave a short interview to E-novine, (an online magazine) journalist Bojan Tončić. We have translated the most interesting parts. Read full article here. All the officers who were in the Visegrad Brigade are pensioned here or are still in the Serbian Army. And the same thing is always repeated: Serbia did not take part in the war, but their officers did and their citizens did. ”It is very important that Milan and Sredoje Lukic were not indicted for command responsibility, they were the direct perpetrators of the most hideous war crimes”, says Natasa Kandic. ”Along with Milan Lukic were many other individuals, even women; sometimes he was a Serb, but when he was to be freed from jail in Belgrade then he was a citizen of another country. During the trial for crimes committed against Muslims from Sjeverin, we got a confirmation document that he was a member of the Republika Srpska Army. So he did not commit crimes that were not known of, Republika Srpska and Serbian authorities were fully aware of them. Every week he was in Belgrade, nobody had the intention to arrest him, because it was part of the strategy to full fill an aim with deportations and murders – the creation of a Serb state. So, Serbia is involved because all the officers who were in the Visegrad Brigade are pensioned here or are still in the Serbian Army. And the same thing is always repeated: Serbia did not part part in the war, but their officers did and their citizens did. And the officers and policemen who were present there, refused to help those who survived the live pyres. In that police they were surely people from Serbia”, says Natasa Kandic.